I guess this is my year for teaching awards. This morning I was honored along with other teachers in the district by receiving the Rotary Students Choice Award. The elementary school teacher awards are selected from seventh grade student nominations. 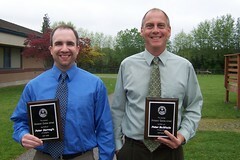 Pete Darragh, friend and colleague, also received the award. I feel doubly honored as this is the same award that Don and I received last year.